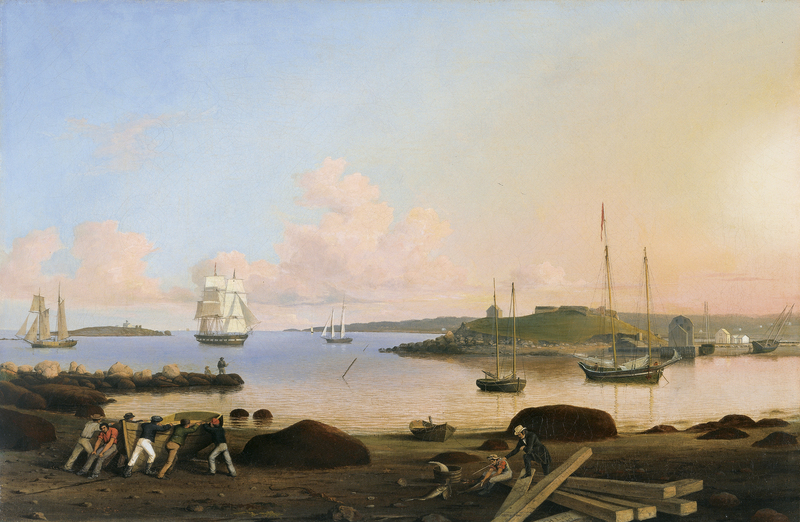 Gloucester, Fitz Henry Lane’s native city, was also the subject of many of his paintings. They are primarily marine views, characterised by their carefully rendered lighting and topographical detail. Lane trained in Boston, the home of the wealthy tourists who commissioned from him canvases like the present one. It depicts Ten Pound Island seen from the port, with small groups of figures handling fish and pushing a boat in the foreground. The calm water is dotted with sailing boats and other vessels omnipresent in Lane’s views. They function as compositional devices and also reflect his particular interest in this motif. As a result, boats become the principal elements in many works. A profound sense of tranquility fills the painting, in which the sea and sky become particularly important due to the amount of pictorial space that they occupy. The calm transmitted by the painting derives from the use of a pronounced horizontal format and from the warm light that tinges the landscape, making Lane one of the most important artists within American Luminism. Fitz Henry Lane, also known as Fitz Hugh Lane, is regarded as one of the most prominent exponents of American Luminism. The Fort and Ten Pound Island, Gloucester, Massachusetts was painted in 1847, shortly after Lane arrived at Cape Ann from Boston, when he had just abandoned print making to become a painter. It depicts life in his native city, the seaport of Gloucester, with Ten Pound Island in the background. The island, crowned by a fort and located in the centre of the bay, owed its name to the price paid by the British to the Indians when passing through this port on their way to the Indies. As in most of his paintings, both the horizon line and the calm waters with their transparent luminosity and the compact rocky forms and vessels close to the port convey great serenity. This sensation of lastingness is what sets Lane apart from the members of the Hudson River School, who were concerned above all with emphasising the exuberance of changing nature. As in many of his early works, the influence of Robert Salmon can be seen, particularly in the wealth of detail and the manner of painting the topographical features of this major fishing port. The narrative elements in the foreground, where the fishermen are shown carrying out their daily tasks, combine, in an appropriate balance, the realism of the scene with an elegiac sense of serenity.